I wish I could take credit for the term “Climate Cliff,” but I cannot. I first saw it referenced by an organization called “RootsAction,” which describes itself as an “on line initiative dedicated to galvanizing Americans who are committed to economic fairness, equal rights, civil liberties, environmental protection – and defunding endless wars.” All of which, by the way, I happen to agree with. If you’re interested in looking into them further, their web address is www.rootsaction.org. But it was this expression, “Climate Cliff,” that most caught my attention. There has been so much talk, so much air-time, so much energy spent of late on endless discussions of and worry about the so-called Fiscal Cliff that I have frankly become almost desensitized to it all. I mean, how much can you worry about whether members of Congress will eventually stop warring with each other and, instead, actually sit down and DO something to help the people who voted them in? I’m sick of it. 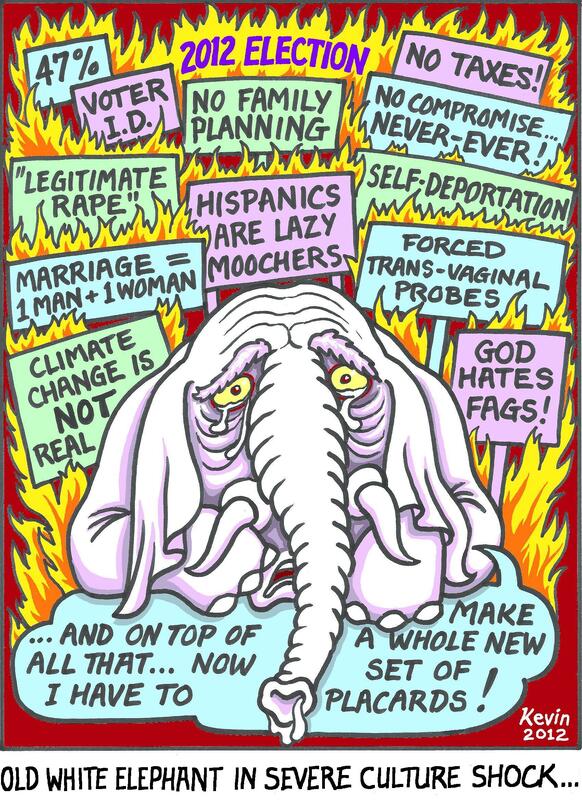 And, yes, I mostly blame the rigid, recalcitrant, and doctrinaire Republicans who seemingly will not budge on the one issue that everyone knows most Americans already agree on, namely, raising taxes on the super-rich. How many times do we have to listen to Speaker Boehner and his colleagues say that this is nothing but a “jobs killing” measure? Come on! It’s clear to everyone that they are simply pandering to the richest of the rich, who put them where they are in the first place. But, you see, I’m already getting off track again. Of course what happens with the economy is vital to all of us, because it means that it affects our livelihood and our ability to take care of ourselves and of those we love. So, yes, it is important. But in the larger picture, it’s frankly small potatoes. In comparison with the looming Climate Cliff, which almost no one in Washington seems to be thinking much about, it’s the most myopic of short-term stuff indeed. Note what even President Obama recently said on the subject: “I don’t know what either Democrats or Republicans are prepared to do at this point. I think the American people right now have been so focused and will continue to be focused on our economy and jobs and growth that, you know, if the message is somehow we’re going to ignore jobs and growth simply to address climate change, I don’t think anybody’s going to go for that.” Really? “Simply to address climate change”? As if that were a simple, or an inconsequential issue, or one that wasn’t in the end going to wind up devastating the planet. The whole thing reminds me of something I once head a Catholic priest say many years ago, something which appalled me almost beyond words at the time, and which I still find hard to believe that anyone could have said. Speaking about birth control or, more to the point, speaking against birth control, he reflected that we really didn’t have to worry about overpopulating the planet anyway, because God in his wisdom sent wars and plagues and mass communicable diseases to keep the population within bounds. What a lovely concept, I thought! God says you can’t use condoms because – well to be honest I’m not exactly quite sure why – but on the other hand it was apparently OK for him wipe out millions of people, who already happened to have been born, but who lacked the money to defend themselves against one infectious disease or another. Such was the reasoning of the Catholic Church at the time (this was in the late 1960’s), but I’m not sure if it has changed all that much since. Although it may be a bit of a stretch, worrying about the economy right now, as important as it may be to most of us, seems a little bit like that to me. At least it does in terms of concerning ourselves with things that do not address the overriding issue. In regard to birth control, the important issue really is that people have too many children, and not that we should (God forbid!) actually rely on wars, disease, and natural disasters to cull the population. And in terms of the future of the planet, we do need to be worried, very worried, about global climate change. But what is so concerning is that I fear Pres. Obama may actually be quite correct in his assessment of things. It probably is true that most Americans are totally focused on the economy, on jobs, and on growth, and the whole idea of what will be happening to the planet in the coming years and decades is so far on the back burner that it’s getting no attention at all. So, what I am suggesting is that we begin substituting the phrase “Climate Cliff” in our thinking, in place of “Fiscal Cliff,” in hopes that all of us, you and I and Pres. Obama and Wall Street and American corporations and political parties and civic organizations and religious groups and governmental and inter-governmental bodies of all stripes, will eventually begin to feel some of the same sense of urgency about global warming as we currently do about our collective wallets. Not to put too fine a point on it, in the end money won’t amount to a hill of beans, if we’re all swimming in a sea of noxious gases, or literally in overflowing oceans, or we are unable to feed ourselves and our families because the ecosystem simply can no longer sustain itself in a healthy way. I used to think, or at least hope, that we would somehow come to our senses about all this because we wanted to preserve the beautiful planet we call home, because it is the right thing to do not to destroy magnificent forests and kill off whole species of animals who have done nothing to contribute to the warming of the globe. But I have come to the conclusion that most of us most of the time are so engrossed in our own little lives that the majority of people cannot get out of the ego-cocoon that we live in. Well, so be it. Let us then worry about climate change for our own benefit. In the end, it does not matter much exactly why we concern ourselves with the issue; the only thing that matters is that we do something about it. We are, indeed, headed toward a Climate Cliff, and no amount of worry about short-term fiscal matters is really going to make much of a difference. Robert and I are always on the lookout for junk and used stuff that we can repurpose to make art or to continue constructing our home and barn art gallery and other buildings here in the woods where we live. 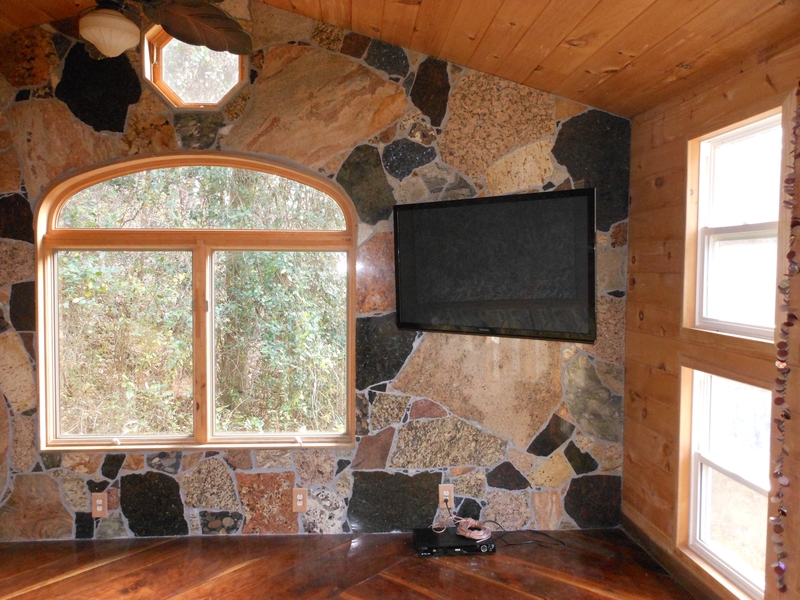 We just finished the polished stone wall, pictured above in the living room of the cottage we are building in the woods beyond the dead-end of our dirt road. This rock wall took us a little over a month of evenings and Sundays to build, and it is a solid example of a junk project. All the double-pane, argon-filled windows in the living room are also salvage. The knotty pine wall and ceiling planking was purchased in an Amish “mud sale” auction. And the black walnut floor was a fallen tree processed by an old order local Mennonite lumber man. Ten years ago from our moving car, we spied some jagged chunks of the beautiful polished stone sticking up out of the dumpster of a countertop business near where we used to live. We didn’t know quite what we would do with it, but we knew we had to have it. The manager of the place said we could take scrap out of their dumpster in exchange for bringing an occasional case of beer for the people who worked in the countertop business. We were enthusiastic dumpster divers for beautiful chunks of polished stone for several years, and ended up moving our heavy treasure to the woods when we sold our big house in the suburbs and moved here. Using salvaged materials to make art and buildings requires an eye for beauty and value obscured by a layer of mud or rust, and a willingness to engage in creative problem solving while working through each customized project. We still did not know what we were going to do with the polished stone. 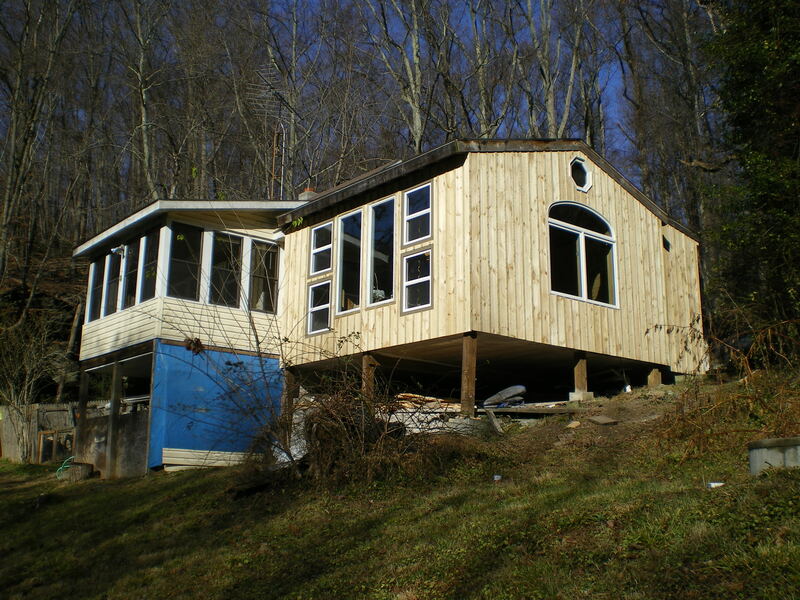 Eventually we purchased three acres adjacent to our original woods where we lived in an old trailerhouse. The new land included a small half-constructed hunting cabin that we decided to finish and turn into a cottage for ourselves. 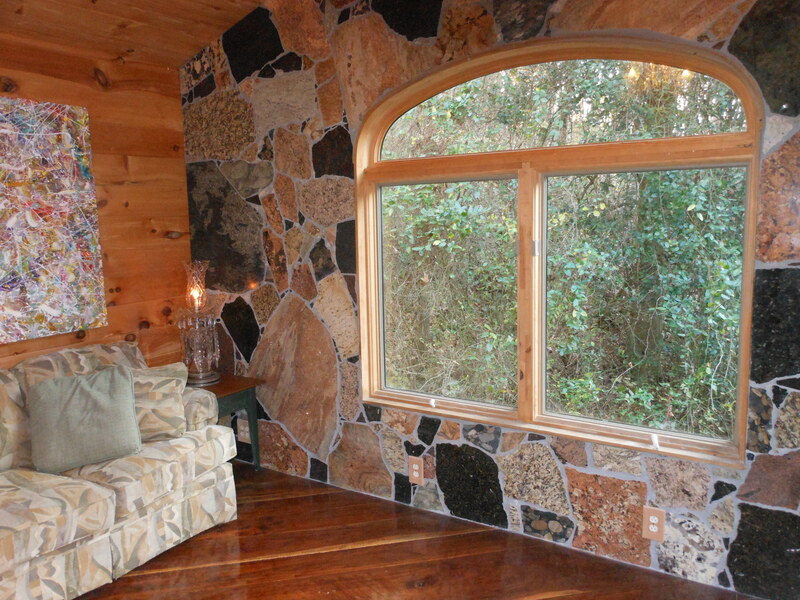 Then it hit us – the polished stone would make a beautiful accent wall in our new home. Six weeks ago we significantly strengthened the foundation supports under the living room to carry several tons of additional weight. 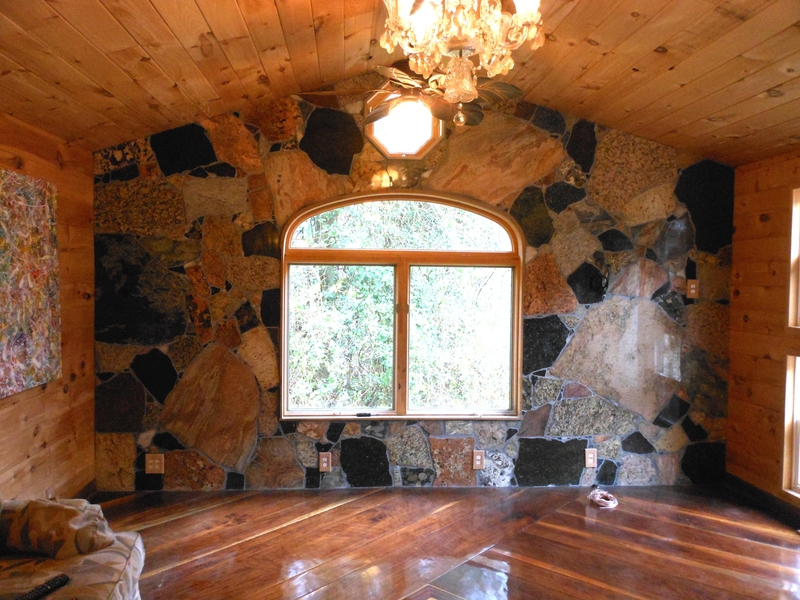 We hauled truckloads of the stone to the cottage and lived with the rock puzzle pieces spread out all over the floor for a month while we constructed the wall. First we had to cover the surface with concrete blue board secured to the studs with long screws every six inches. We found industrial strength mastic, especially formulated for heavy rock walls, and buttered the back of each rock as we installed it, with shim and occasional support screws in between. It took both of us to lift some of the larger 1.5”-thick stones into their places. When the entire puzzle was finally solved, Robert grouted the whole wall in one afternoon and washed it about 20 times. We love our humble little cottage in the woods even more than we enjoyed our big fancy house in the suburbs. Yes, we are still sleeping in a corner in the unfinished kitchen and cooking with an electric skillet and a 50-cent garage sale microwave, but we have never eaten or slept better. Next summer maybe we will use some of our salvaged lumber to build a bedroom or two. The hunting cabin itself was a piece of junk when we bought it. Friends strongly advised us to tear it down and start over. The previous owners were chain smokers with five indoor pit bulls and Rottweilers. They left mountains of the worst kinds of garbage and trash all over the property. The cabin itself smelled so foul that the only way we could plan and take measurements was to run in holding our breath and look around for 60 seconds before bolting out again to gasp for air. We had to leave the building open to the elements for over six months before we could bear to spend time inside and begin the massive cleaning chore. So, we understood why people felt we should tear down the place and start over, but we could also see very clearly that the basic construction was strong and sound, and we knew that if we could purge and clean it, the skeleton would be a good beginning upon which to construct a new home for ourselves. Four years later it is becoming a real jewel, and the memory of the stinking junk heap it used to be has faded from our minds. Now we see only what it is today and what it will become tomorrow. We are using mostly salvage windows, doors, lumber and stone to build the house, and we do all the labor ourselves, so our costs are very low. It’s a house made of junk, and we are very proud and happy to live in it. If your couch and chairs and rugs are starting to look a little ratty, paint them! Robert’s painted furniture is very popular. Be sure to use water-base acrylic paints, because they remain rubbery and flexible and do not get brittle when dry. All you need to become a “creative recycler” is an eye for interesting used materials that might be good for some future purpose. You have to believe that junk can be cleaned and repurposed to make something interesting and beautiful. The “outside settin’ sofa” and 3 straight back chairs and rug above were ready for the junk heap. So Robert painted them in his inimitable style with acrylic paints, and now they have a new life. It helps if you are willing to be a bit of a pack rat and store junk for a while until the right opportunity comes along to give it a new incarnation. We collect and store lots of junk. Two days ago we brought home a big truck and trailer load of used lumber from a country dwelling that was being demolished. Flea markets and garage sales are great places to find valuable junk. I made the “Jeweled Christmas Tree” above almost entirely from junk jewelry and beads and fake pearls that I found at such places over a period of years. The finished junk jewelry mosaic is one of the most popular art projects I have ever completed. Everyone seems to want this pile of junk! Another building on our 12 woodland acres that looked like it might not be long for this world was our 150-year old barn. The front wall had collapsed outward substantially, because the former owner cannibalized the major support rafter that held the building together, to use for other purposes. The first time we walked into the collapsing barn, Robert fell through the floor and into the lower level which was full of flood debris and disgusting trash. It turned out that all the full timber floor joists had been turned to powder by termites. The floor was nothing but dust! What a mess! A lot of people might have left the old barn to fall down, but we discovered that the old oak frame had hardened to the consistency of steel and was extremely strong. So we decided to save the structure and turn it into our Barn Art Gallery. We constructed an entirely new load bearing front wall inside the original collapsing wall. We took out the floor and built a new one. Multiple rafters now hold the building securely together. We covered the interior walls with a puzzle of irregular shapes of salvage plywood that we bought from an Amish farmer after he removed a thousand nails from the 40 pieces. We constructed dormers and installed salvage windows. Today it is a beautiful and peaceful refuge beside our stream and pond, decorated with junk furniture and carpets that people were planning to throw away. 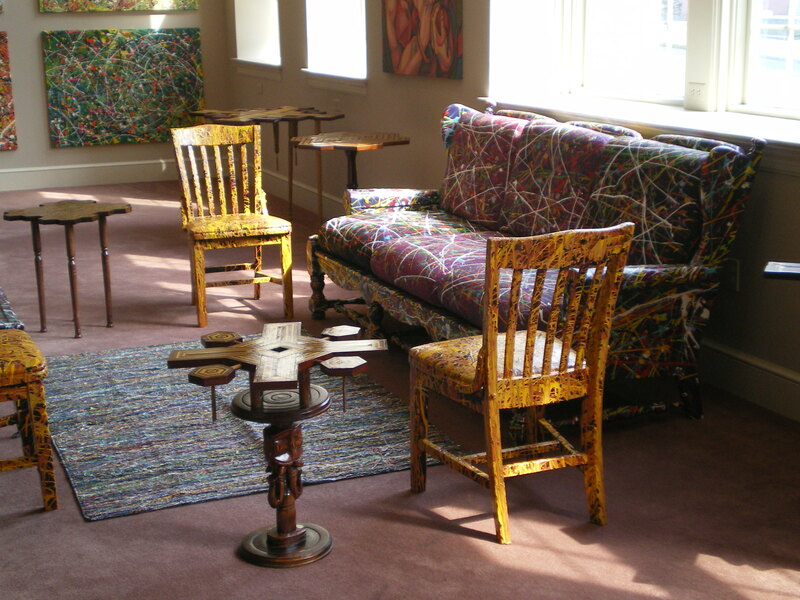 Eventually we hope to expand the gallery to show more art. We often get criticized for buying water and sodas in plastic bottles, but I have saved every single container for seven years, and I am starting to make art out of all of them. We personally drank all the water and soda out of the plastic containers that make up the somewhat tongue-in-cheek “Rose Window” above. It looks beautiful when the sun shines through it. I am still constructing a water bottle chandelier. Each of the 220 bottles glows with a tiny white LED light stuffed inside. I’ll add another 100 water bottles and hang the chandelier from the vaulted ceiling over our kitchen. I am also planning to make tall glowing cone-shaped trees of plastic bottles as outdoor sculptures. Randy, our little pug puppy, fell asleep on the edge of his water bowl, slipped in and drowned. But Robert brought him back to life with five minutes of vigorous mouth to snout CPR. 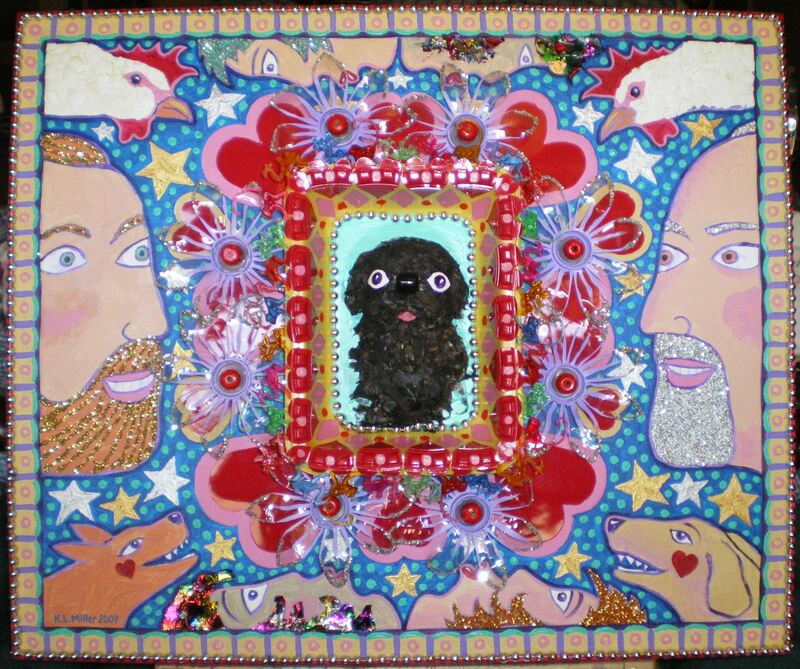 My 16″ x 20″ junkart construction, “Randy Valentine,” commemorates the joyous resurrection of our puppy. Randy is healthy and normal today. “Randy Valentine,” above, is a small prototype for larger junkart pieces to come. Our pug Randy is immortalized as he looked when he was a puppy. Here he is made out of shredded junk mail paper mache with real painted egg shells for eyes. He is nestled in a yellow styrene chicken tray adorned with hearts cut out of used red plastic picnic plates and surrounded by flowers made of water bottles. I bought the glitter and beads and tiny plastic animals for pennies at our local dollar store before it closed. The chickens are made of eggs shells. Why make art and buildings with junk? We all know how important it is to recycle. The earth is smothering in our junk – especially the carbon emissions and greenhouse gas junk we are spewing into the atmosphere, mainly by burning fossil fuels. If we want to leave a place where our children and grandchildren can live in the future, it is important to stop dumping our junk into the vital waters, soils and atmosphere of our home planet. It is time to buy and use less stuff, and begin finding new uses for our old junk that will otherwise end up in the landfill. It is certainly important to collect our plastic, glass and paper and turn it over to recycling systems that can convert those forms of junk into reusable pellets to make new stuff. With a little bit of creative thought and a new mindset that looks for ways to repurpose our junk, we can also eliminate the middle man and give our junk a whole new life on our own! And it’s loads of fun! If it weren’t for what it brings to mind in regard to one of the bloodiest and most inhuman conflicts the country has ever had the misfortune of going through, namely the Civil War, it would almost actually be funny. Imagine that more than 100,000 people in – where else? – the great state of Texas, and thousands of others in all of the other states, even places like California and New York, have petitioned the White House to secede from the Union. Not to worry, of course, because it obviously is not going to happen; still, who even knew anyone was thinking about such a thing? It does, though, go to show the depth of anger, bitterness, and sense of betrayal engendered in many by the recent presidential race, leading up to the second-term election of Barack Obama as the 44th President of the United States. It has always amazed, puzzled, and frankly sometimes terrified me to see the depth of hatred – and I think that is not too strong a word – that many people in this country feel toward Pres. Obama. Sadly, I don’t think it’s an exaggeration to say that much of it is based on plain old bigotry, that is, racial animus and bias, exacerbated by what I would call the mildly liberal agenda of our current president. You definitely do not hear the words “move on” or “leave” or “let’s get the hell out of this place” from archconservatives. No! Instead, it’s more like “declare separation,” “form new communities (where they currently are),” and “defend ourselves, our families, and (of course) our sacred honor.” It fits right in with the conspiracy theorists, who are building bunkers and stockpiling canned goods, along with caches of ammunition and semi-automatic weapons, in preparation for the cultural Armageddon that is sure to come. It’s kulturkamph, some would say, all over again, that attack in the 1870’s by Otto von Bismarck on the Catholic Church in which hundreds of priests and bishops, along with their faithful followers, were expelled from Prussia. In fact, conservative Supreme Court Justice Antonin Scalia even references kulturkamph, or its direct translation, “culture war,” in more than one of his written opinions. All this brings to mind another opinion, this one stated just yesterday by none other than the losing candidate, himself, Mitt Romney. In a talk to his disappointed major donors, he is quoted as saying that “the Obama campaign was following the old playbook of giving a lot of stuff to groups that he hoped could get to vote for them and be motivated to go out to the polls.” He goes on to specify who he’s talking about, namely, African-Americans, Hispanics, and young people. I suppose he might have mentioned women, too, and maybe even gay people, if they even counted in his mind, which I very much doubt that they do. But doesn’t this sound an awful lot like those moochers, those freeloaders, that 47% of the American population (according to his tally, anyway), who basically want to live off of the back-braking hard work of the God-fearing, money-making, tax-paying, overburdened straight white males, who do all the work in this damn country anyway? But what actually are these “gifts” that we’re talking about? It can’t be anything other than the right to be educated, to find a job, to work to better yourself and your family, to be able to afford health care, such that if you’re sick you don’t have to go into bankruptcy, to say nothing of someday being able to buy a house, or at very least afford a rental apartment to live in. Romney was pulling no punches. Apparently he felt that there was no longer any need for him to dissimulate, sneak behind anybody’s back and say this only in the privacy of an exclusive banquet room. No more need to try to make the public believe that he was some kind of compassionate conservative. He went on to say that these were the people who made between $25,000 and $35,000 a year, but who want healthcare. Can you imagine? Poor people (or at least struggling lower middle class people), who actually have the temerity to think that they should get medical attention in the event of an accident or an illness. Why, it’s unheard of! And he specifies Blacks and Hispanics as those who are particularly pushy in this regard. Black and brown people who want the same care he and his white family have always been able to afford – imagine! He goes on at some length to list other such “gifts” that Obama supporters were essentially bought of by, things like “amnesty for the children of illegals,” and the extension of healthcare on their parents’ policies for people 26 and under, which supposedly brought many college aged women into Obama’s camp. These are the “gifts” Romney is talking about. But it’s funny, to me they just seem an awful lot like the things that a majority of the American people actually want and deserve. You know, the things that a certain segment of the population has always had, and which they want to hold on to: education, jobs, health care, ability to afford a home etc. And who wouldn’t? That’s exactly the point, in fact. These things are not gifts at all, they are basic human needs and desires that everyone wants and requires for themselves and their families. And to have the audacity to refer to them as “gifts” merely shows how out of touch Mitt Romney is from so much of the experience of everyday Americans. So, if there were any possibility, I guess I would say that maybe we actually ought to let this minuscule portion of the population secede that seems to want to do so. We could give them a couple of counties, maybe, someplace where the rest of us don’t want to live anyway, and see how well they fare. But since even that isn’t going to happen, for now all we can say is let’s stop getting distracted by this secessionist craziness and get on with the business of attempting to deal with the innumerable problems that actually face this country. Sufficient for the day is the evil thereof, the nuns always told me in grammar school. There’s no need to manufacture more. I only hope the Joseph Farah’s of the world hear that, and work with the rest of us, rather than trying to do everything in their power to bring about greater disharmony. And let’s let poor Mitt Romney, too, slink off to one of his mansions, where he can pay for all the medical help he needs to lick his wounds and recover from the political pummeling he so richly deserved. Now that election 2012 is over, and the results are so promising, it’s time to get on with the business of exactly why we elect people in the first place, namely, to govern. Not so much governing has taken place for quite some time in this interminable run up to November 6th. It seems as though that run up by itself has lasted for at least a couple of years. So, it’s definitely time to get back in the saddle again. It’s obvious that the first order of business has to be the so-called Fiscal Cliff, those automatic spending cuts and tax hikes which will go into effect in January of 2013. In my view, it would be a complete disaster if they happen, as it would probably trigger at least a “mild recession,” according to any number of economists. But even a mild recession, in the wake of the Major Recession we have just gone through, could be devastating. In fact, it brings to mind the latest nor’easter to hit New York and New Jersey on the heels of Hurricane Sandy. Ask the folks there, who were without power and literally under water, and who are again going through a similar ordeal, if another blow is an easy thing to take. I think you’ll get an earful. It would be the same thing if the President and Congress are unable to work out some sort of compromise to prevent us from heading over this fiscal precipice. But that’s just the beginning. There is a whole host of things on everybody’s plate that needs to be attended to. It’s almost as if things have been on hold for two years, and now finally it’s time to get a move on. The President has already said that Immigration Reform will be high on his list, and that is surely a good thing. This country has actually always had a love-hate relationship with its immigrants, in spite of the comforting old myth of the melting pot. Very few of the established Anglos wanted those damned Irish, or the Italians either for that matter, back at the end of the nineteenth century, just as many don’t want the Mexicans, or other Latinos, today. And just as with the Europeans, so too with Hispanics, epithets such as “lazy” and “free loaders” are thrown around with nothing to back them up. We won’t get to a truly fair and comprehensive immigration reform package, I believe, until we come to terms with how we really want to perceive, and therefore how we treat, new arrivals to this country. Another major problem that has to be fixed is the economic one. I am nothing if not a liberal, and I hope a progressive, but I do agree with conservatives that something has to be done about balancing the fiscal books. We cannot go on spending so much more than we take in, and we most definitely cannot go on simply borrowing money from China and elsewhere in order to cover the gap between spending and income. Toward that end, we have to be upfront and transparent about how we spend the money we do have. One of the most despicable things about the administration of George W. Bush was how they hid the cost of two wars. These military incursions were utterly unfunded; they never even made it to the budget talks. And this is aside from the fact that, in my view anyway, they were both totally unnecessary in the first place. But that’s another question entirely. The only way to balance the books is some combination of reasonable spending cuts and equally reasonable tax hikes. It also assumes that we will come up with a way to handle so-called entitlements, although personally I hate that word. It always comes off to my ear as sounding as though people are getting something for nothing, something they don’t really deserve. That is not the case in regard to Social Security, which those of us who receive it (myself included) have paid into for upwards of forty years, or however long a person has worked. The same is true for Medicare, although in regard to medical costs in general the country has also got to have a very serious conversation about what is actually appropriate, and in the end, what we can afford. This will not be an easy discussion, inasmuch as it concerns both ourselves and the lives of those whom we love, and just how much care is enough care. But the topic has to be on the table. These are things that adults talk about, and that we need to talk about. Beyond these things, education looms high on the list, too. For far too long we have been putting off decisions about comprehensive funding that will get our children – all of our children – ready for the highly competitive world of the 21st century. It will have to be a discussion that takes place at the national, the state, and the local levels, since funding for education and decisions regarding how kids are educated happen at all three levels. But when a baseball player (nothing against baseball, as much as I find it one of the most boring sports on the planet), or a football player, or a movie actor, or a CEO of a company that rapes the planet, earns millions of dollars, and educators are paid a pittance, it seems to me that there is something seriously wrong with our value system as a society. And remember that politicians are really only reflections of ourselves. We hire political leaders in the first place by voting them into office, and by keeping them in office (or not) once we’ve seen how they perform. So, if we continue to elect people who do not value the things we say we value, then in the end we have to examine ourselves, and we have no one to blame but ourselves. I could go on with a long list of things that have to be dealt with, and no doubt anyone who reads this could add others, equally as important. Clearly, the economy and jobs go hand in hand, and you do not fix one without the other. And this includes jobs for everyone, including people who have been traditionally shunted out of the good life of the American middle class, people of color in particular who have suffered more profoundly than anyone else during the years of the Great Recession. Other things come to mind, as well, things like the infrastructure of the country, which is crumbling, care for the sick and the indigent and those who cannot care for themselves, always a bell weather in terms of what a society considers important, and so-called energy independence, a silly pipe dream in itself unless and until we wean ourselves off of fossil fuels. Which leads me to the final point that is on my mind in regard to the new administration, and the Republicans in Congress as well, because the latter can block almost anything they want with the majority they have in the House of Representatives. And that topic is the eighteen thousand pound gorilla in the room, namely, climate change. Now here is a topic for the ages! And not many more ages, in fact, if we do not somehow come to grips with its disastrous implications. I have to say that I was appalled at both candidates during the presidential campaign that the words climate change or global warming almost never passed their lips. It is, though, a topic that in the final analysis trumps all others. And I do mean all. Because we can do whatever we want to fix the economy, to create wonderful jobs for people, to educate our children, to care for those who cannot care for themselves, to grant equal rights to minorities, pay down the debt, and on and on, but if the planet rebels – in ways that I think we have only begun to see – then none of these other things matter. If we do not have a hospitable planet on which to live and to raise our children, and even, God help us, to play baseball on, then everything else is for naught. The old Republican adage of “drill, baby, drill” sounds almost like a hateful curse to my ears. It is at very least the cry, and maybe the last cry, of the utterly deluded. There are surely things that all of us can, and must, do in order to help play our part. We can and should conserve and not be wasteful, find alternate sources of energy, recycle, and we absolutely have got to stop having so many children. At seven billion people and counting, the world already has far too great of a population for the planet to sustain. And we must find a way to satisfy our need for power that does not, as a byproduct, pollute the air, the water, and the earth itself. All of this is necessary, and some of it can be done on the personal and the local level. Even so, that will not be enough. Governments, and whole associations of governments, absolutely must take this on as a priority – no, as THE major priority – because the ravages of catastrophic global climate change will not respect race or ethnicity, wealth or poverty, one economic system over another, or anyone’s arbitrarily drawn political boundaries. It will get us all, if we do not take steps now to make a difference. So, I admire and appreciate President Barack Obama very much. I also feel for him, and hope and pray that he will have the strength and the wisdom and the determination to take on these problems we are all faced with. If we do not assist him in this task, then we are all to blame. It is time now to act and to stop playing politics. And if we do not, there is no doubt in my mind that we will all suffer the most dire of consequences. For many years the very mention of climate change has been taboo for TV reporters and commentators. It was never discussed. Mother Nature has been trying to focus our attention on this issue, because it is killing Her. She broke off chunks of Greenland the size of Manhattan and we barely noticed as they floated away. She virtually destroyed New Orleans, but President W and “Brownie” and the rich and powerful paid no attention, because the masses that suffered and the thousand who died were mostly poor people of color. So Katrina did not work. Mother Nature deprived much of the country of a real winter last year, and everyone just said “thank you.” Finally, She decided to go really big with her attention grabbing statements, and last summer She burned up all the Midwest crops in a disastrous drought, reduced the mighty Mississippi River to a trickle, and charred huge swaths of the West with massive wildfires. There was still virtually no mention of climate change! What does a damsel in distress have to do to get saved these days? Mother Nature has finally succeeded in focusing some attention on Her own dire plight. Suddenly almost every TV news reporter and commentator cannot stop talking about climate change. There are featured stories and discussions about it on cable news. New York’s Governor Cuomo made it clear in public statements that the Hurricane Sandy disaster was caused by climate change. New York City’s Mayor Bloomberg belatedly and abruptly endorsed President Obama, indicating that the president was more likely than Romney to do something about climate change. Then Bloomberg was forced by public outrage to cancel the New York Marathon because everyone demanded that those resources be allocated to disaster relief. Mother Nature has come to the sad realization that She has to take her plight directly to the doorstep of power and money if She is to be heard. Hurricane Sandy has made climate change a conservative issue. It may take a few more hits like this one where the rich and powerful live, work and play, on Wall Street and the Jersey Shore, and other bastions of wealth, power, luxury and privilege, but Mother Nature will eventually force conservatives to begin pushing for a halt and reversal of climate change. 1. Loss of Property — Nobody likes to lose their hard-earned, cherished property. New York City and the Jersey Shore comprise one hell of a piece of property to lose. Did you see the photos of all those yachts and luxury cars piled up on the Jersey Shore?… and all those destroyed weekend homes and resorts and vacation areas? Wall Street was under water and shut down for two days. This kind of sudden loss is a real shock to anyone who is attached to material possessions, and who is not? People are going to want to be assured that their property will be protected, especially when insurance is priced out of sight. They’ll talk about massive sea walls and gigantic ocean gates and fortress engineering for a while, but eventually it will become clear that Mother Nature will take what She wants if we do not stop killing Her by altering the chemistry of Her atmosphere and oceans and soil with carbon and greenhouse gas pollution from fossil fuels. 2. Extinction is Bad for Profits — The sad economics of ignoring escalating global climate change and ecological destruction, add up to a lose/lose/lose/lose scenario for A. Business/ B. Wall Street Investors/ C. Governments/ and D. The Electorate. The people who comprise all four of these elements of civilization will die off when Earth becomes a boiling, burning sci-fi planet, and there will be nobody left to play the game of capitalism. In order for commerce to work, we must have at least sellers and buyers. Without either one of those there are no profits and nobody to collect the profits. Then the game is over. 3. Cost of Preparedness and Disaster Response — Five days after landfall, on MSNBC’s must-watch weekend round table, “Up with Chris Hayes,” Klaus Jacob of Columbia said that in about 85 years the sea level in Manhattan on a calm sunny day will be the same as it was at the height of Sandy’s storm surge. Two years ago he wrote a study predicting every detail of what happened in Manhattan this past week, right down to the specific flooded tunnels and subway lines. Now he asserts that investing in preparedness engineering will cost 10 times less than relying only on disaster clean-up, but either way it’s going to be extremely expensive. The clean-up for Katrina was way over $100 billion. Losses from Sandy are estimated at $50 billion. Who knows how much the clean up and replacement bill will be? It seems only logical that conservatives will eventually ask how we can treat this problem at its root so that we can stop throwing obscene amounts of money at preparing for or cleaning up after the symptoms. 4. Public and Political Pressure Mount — Governments and political entities do, in fact, respond when the force of public opinion becomes insurmountable. 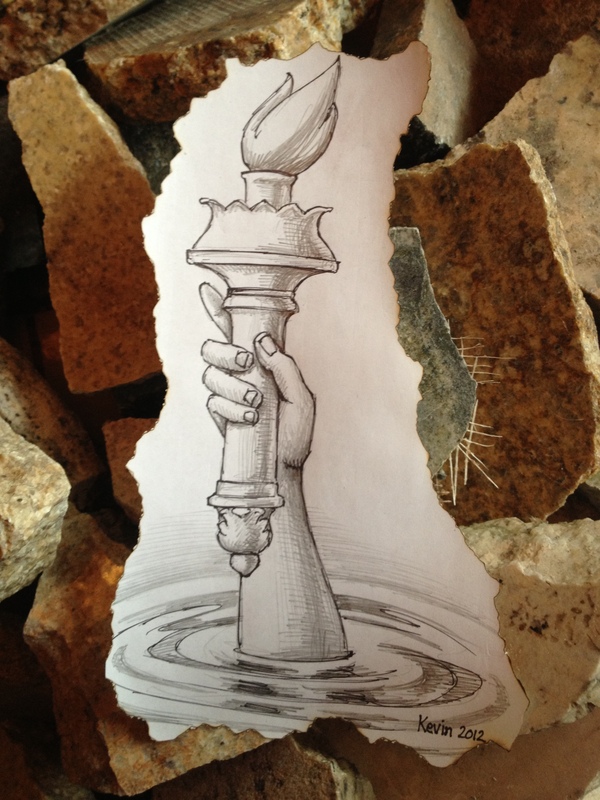 Witness Mayor Bloomberg’s cancellation of the New York Marathon this week. He really did NOT want to do that. But the public outcry was overwhelming, and the mayor heard from virtually every significant city power center that he had no choice but to shut it down and reallocate those resources to disaster relief. So he did. As extreme weather disasters increase in size and frequency, and the media are inundated with images and stories of unbelievable suffering all across the socio-economic-political spectrum, the masses, including wealthy and powerful hard-hit conservatives, will demand a response, and they will get it. 5. Everyone Cares about the Survival and Happiness of Their Kids and Grandkids — It won’t matter whether people are conservative, liberal or moderate… When it dawns on everyone that their kids and grandkids may not be able to survive in the future we are setting up for them, everyone will pause. We will all have to ask ourselves why we are working, creating and procreating if there is no future — no civilization to build — no place or time for our children to live and carry on our legacy. We will all realize that it is time to stop and turn this thing around, if only for the sake of future generations. Aside from these five points, conserving the planet really ought to be a natural conservative issue. It seems like leaving our children a planet, climate, oceans, soil and atmosphere at least as healthy as the system we inherited from our ancestors is a smart, conservative thing to do. It’s sort of like investing money for our future financial security. Or maybe a better analogy would be doing due diligence on the maintenance of our house so that we can protect and sustain the investment we have in our home. Earth is the only home we have. The conservative approach would be to maintain our home for the security and wellbeing of future generations. It’s just the common sense responsible thing to do. What’s next? Conservatives, liberals and moderates will join forces and demand with one voice that governments and fossil fuel companies switch as fast as possible from extracting and burning fossil fuels to developing and supporting renewable clean energy sources and lifestyles. Last year Exxon-Mobile made more profit than any company in the history of money, and our government gave them your tax dollars and mine to subsidize that historic windfall, which is killing Mother Nature. Is that okay with you? Of course it’s not. Mother Nature will no longer allow escalating fatal climate change to be a polarizing political issue. This is a matter of life and death for Her, for us, and for our children. It’s time to join hands with our political foes and opposites and force governments and fossil fuel companies to switch to clean renewable energy. Talk it up. Make noise. Write letters to editors. Make art about it. Demonstrate on the streets. First: Organize — Join 350.org and Bill McKibben’s efforts to stop climate change, or another group like Citizen’s Climate Lobby, or start your own local organization to combat climate change in your own region. Third: Divest — Remove all your investments from fossil fuel companies, and demand that your churches and colleges and universities and other institutions do the same. Buck up Binky… It’s time to exhibit some courage — It is tempting to feel overwhelmed in the face of humanity’s greatest survival challenge in all of history. “Eco-Anxiety,” denial and avoidance are natural human responses. But we are out of time. There is no time left to pretend that this will just go away. Extreme weather-related disasters, caused by climate change, are increasing rapidly in size and frequency. Many of the actions listed above are easy to do. We can all do them even if we are scared, depressed and overwhelmed. The good news is that governments and companies will be forced to respond even if only 10 — 20% of us join forces and demand change. It is NOT too late. We can do this together — conservatives, liberals and moderates. All together now… SCREAM BLOODY MURDER! Demand an end to the extraction and burning of fossil fuels, and a switch to clean renewable energy sources.